According to the United Nations, Tropical Cyclone Idai is one of the most devastating natural disasters to hit Africa in the last 50 years. Millions of people across Mozambique, Malawi and Zimbabwe were affected by the raging storm. Heavy flooding rain and strong winds tore through cities and villages after Idai made landfall in Beira, Mozambique, on March 15, 2019 — leaving a path of complete and utter destruction in its wake. The consequences are horrendous: Hundreds of people are confirmed dead and many are still missing; hospitals, clinics and homes of countless families are entirely destroyed; roads and entire villages flooded, leaving survivors stranded on rooftops for days. The eye of Cyclone Idai slammed right into Beira, Mozambique as it made landfall on the continent — exposing the large coastal city of Beira to the storm at its very most powerful. To make matters worse, a large part of the area was already flooded as Mozambique nears the end of the year’s rainy season. Tropical Cyclone Idai left a path of complete destruction as it ravaged through Beira, Mozambique. Hospitals, clinics and homes of countless families are entirely demolished. Survivors search through the ruins of their houses in search of meaningful personal belongings, in hopes that some may have withstood the storm. It was about 10 p.m. when Gerume Nhambo and his family finally fell asleep in their home in Beira. Outside, Cyclone Idai raged on, its winds ripping roofs off buildings and rains flooding fields that were almost ready for harvest. Suddenly, Gerume awoke to find the walls of his home collapsing; the family ran for their lives, finding shelter at a hospital across the road. The Nhambo family is just one of many the Project HOPE team has encountered in the wake of the devastating storm as Project HOPE’s health-care workers make their way across ravaged communities. When the Project HOPE team met them, they were sifting through the debris of their home in search of the family Bible. They didn’t find it. Gerume Nhambo and his family lost their home and most of their belongings when Cyclone Idai ravaged through Beira, Mozambique. The cyclone left some 1.8 million people in urgent need of just about everything – from food and clean water to shelter and medical care. Idai destroyed many health facilities, and cut off access to those somehow left standing. Officials at the only operational hospital in Beira said they are running out of medicine and other essential supplies – and with no electricity, they were working in the dark. 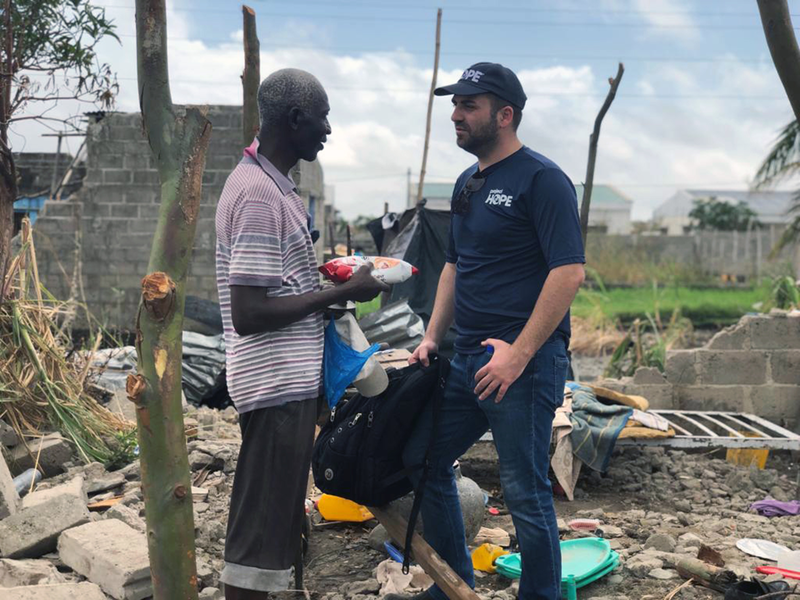 Moreover, there aren’t enough medical professionals on the ground to treat the survivors who face the looming threat of respiratory infections and water-borne diseases. Project HOPE has a team of medical volunteers on the ground in Beira, Mozambique. Project HOPE quickly deployed Portuguese-speaking medical volunteers from the U.S. and Brazil. Our medical volunteers treated patients at a temporary shelter, many of them women and children from the village of Buzi. Located at the Institute for Training of Public Administration (IFAPA) in Beira, the shelter – or accommodation center, as local authorities call it – is now home to close to 2,000 people, including 400 children. The most common medical issues the patients are facing: fever, diarrhea and malaria. With little clean water, poor sanitation services and inadequate hygiene, the big fear now is the potential for a cholera epidemic, which the country has seen before. Our team is traveling by any means necessary to reach the most hard-to-reach communities — those that, three weeks on, still haven’t received any assistance. Provincial health authorities deployed Project HOPE’s medical team to Vinho in the Nahmatanda district – the only way to get there, a helicopter. What’s next for Idai survivors in Mozambique? Infectious disease outbreaks are common after disasters, especially when people don’t have access to clean water or proper sanitation facilities. In Mozambique, Project HOPE is extremely concerned about the potential for a large-scale cholera outbreak, which could result in many more people dying, potentially even more than doubling the toll of lives lost as the immediate result of the cyclone. We are already seeing a large number of patients with acute watery diarrhea. Whether or not these suspect cases are cholera can only be confirmed through lab testing. Not only would an outbreak of cholera take many more lives, it would also increase the complexity of meeting urgent humanitarian needs. Many more resources — including pharmaceuticals, hygiene kits, water purification tablets and medical and hygiene supplies — would be needed to tackle and contain an outbreak, on top of ongoing basic recovery efforts after the storm. Over the next week, Project HOPE will begin delivery and distribution of essential medicines and medical supplies such as acetaminophen, blood thinners, consumables and basic medical equipment, as our team on the ground continues their efforts to reach the most vulnerable communities. After Category 5 Hurricane Matthew struck Haiti in October 2016, Project HOPE swiftly deployed a medical volunteer team to address immediate health needs and construct cholera treatment centers in hospitals and clinics to prepare for a cholera outbreak. Repeated cholera outbreaks have presented an ongoing challenge in the country since the massive earthquake of 2010, and Project HOPE had been training and assisting local health care professionals ever since then. Recently, Project HOPE helped establish a 20-bed cholera treatment center at Ste. Therese hospital in Miragoâne (the primary referral hospital in the Nippes Department region). Learn more about the cholera treatment center in Haiti. Recently, Project HOPE partnered with the Sextant Foundation and others to build a sustainable, 20-bed cholera treatment center in Haiti.